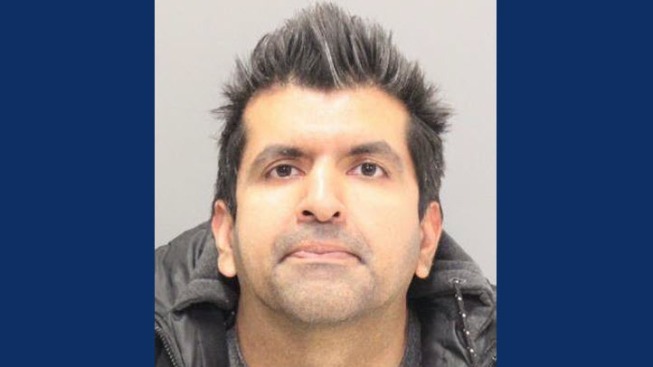 A 35-year-old Cupertino man was arrested Wednesday on suspicion of stalking and "annoying" four underage girls, according to the Santa Clara County Sheriff's Office. Rajeev Sanhi is believed to have at least 19 female juvenile victims, sheriff's officials said. The investigation began when a 14-year-old girl reported that she was repeatedly approached by a man later identified as Sanhi on multiple occasions in which he offered her gifts of money, show tickets and other material items, sheriff's officials said. The girl said Sanhi also followed her home more than a dozen times, and even after a member of the girl's family confronted him, Sanhi continued to follow and harass the girl, sheriff's officials said. "We've got to give a lot of credit to our very strong victim, who was able to help in the investigation and maybe save some other young women," Sheriff Laurie Smith said. Sanhi has numerous similar encounters with law enforcement on record in the cities of Saratoga, Los Altos, San Jose, Los Gatos and the Los Angeles area. At Sanhi’s residence, sheriff's investigators recovered several collages of the underage victims, gifts for the victims and even a personalized license plate for a victim, the sheriff's office said. "After the search warrant, we had greater concerns," Smith said. "I'm outraged. When I heard what they had on the wall, with the photographs of these victims, it's scary stuff." Sanhi has been connected to several South Bay churches where he attempted to volunteer as a youth mentor or pastor, sheriff's officials said. Sanhi also has applied to be a schoolteacher and nanny. A man at the home where Sanhi was arrested said he had no comment. The house is just a block away from an elementary school. Those who live nearby were stunned. "I have three kids; they go to nearby schools, and this is an absolute horror," neighbor Vamadaven Namboodiri said. Sanhi often gave a business card to his victims that referenced his website, jcmakeover.com. Sanhi was booked into the Santa Clara County Main Jail, with a bail amount to be determined, the sheriff's office said. Los Altos police assisted in the investigation. Detectives believe there are still several unidentifed victims. Anyone with information about Sanhi or the investigation should contact the Sheriff’s Office Detective Bureau at 408-808-4500.